Nurudeen Kazeem, the alleged robbery suspect, who was last week arrested by the operatives of Rapid Response Squad, RRS, of the Lagos State Police Command over the shooting of RRS police officer in LASU-Igando area, has confessed that he honed his shooting skills as a cultist. 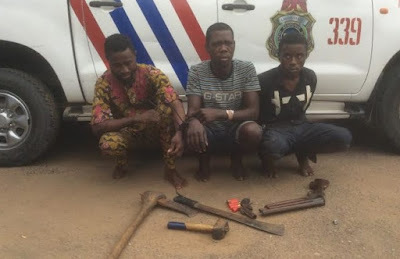 Nurudeen, popularly known as “Onyabo”, 27, a trained tailor turned okada rider, was arrested last week by the RRS Decoy Team in connection with the shooting of an RRS officer investigating chains of robbery cases in LASU-Iba/Igando area. Nurudeen had shot the officer in the leg while trying to dispossess a delivery man of some expensive phones one of the gang members had ordered online for delivery at a specific address around LASU-Iba Road. Onyabo, while confessing to the police stated that he shot the officer twice in the leg to avoid arrest. He added that he was trained to kill by cult members after his initiation into Eiye Confraternity. “I have killed two people in the past. One was to complement my initiation into Eiye Confraternity. I was led to a beer parlour in LASU-Iyana Iba axis, where I was showed a man to kill. I shot the guy there and I escaped. “I killed another guy after shooting at him, I also macheted the victim who was a member of an “Eiye” confraternity in LASU/Iyana Iba area. I and a friend of mine were forcefully initiated into Eiye Confraternity. We were asked by some guys to use our okada to take them to a naming ceremony. “Those guys changed the route after bringing out guns to scare us and led us into a bush where other innocent guys were to be initiated into the confraternity. In the bush, they beat us mercilessly. That was how we were initiated. Since then, they armed me with gun and cartridges to kill people, particularly, rival cult members. It was while doing this that I was invited into robbery by Cali (Wilfred Ehis),” he disclosed. Wilfred Ehis, 30, was re-arrested by the operatives after the arrest of Nurudeen. According to investigations, he had been the brain behind several robberies in LASU-Iyana-Iba and Igando. Sources revealed that Ehis and his gang members lodged in different hotels around the area. Ehis, from whom a short gun was also recovered sometimes in April, 2017 in company of three other accomplices had confessed to the police that he hired Nurudeen Kazeem to help him rob delivery men of online shopped phones. Arrested along with Kazeem were: Yusuph Bello, 33, the gang’s armourer from whom two guns and machetes were recovered, and Sunday Hassan, 26, the gang’s bike rider. All the suspects have been transferred to the State Anti-Robbery Squad, SARS office in Ikeja for further investigation.